Four pole vaulters from the Chesterfield and District Athletics Club competed at the Scottish Athletics Age Group Championships and came away with three medals and two personal bests. The weekend competition at the Emirates Arena in Glasgow saw Chesterfield quartet Alistair McInulty, Rebecca Conway, Lauren Hill and Joe Houghton take on their Scottish counterparts. Starting with the golds, McInulty won the U20s Mens event with a personal best of 4.10 metres and Conway also took top spot in the U17s Womens catagory with a height of 2.60 metres. Hill claimed silver with a best on the day of 2.50 metres in the U15s Girls age group and Houghton finished sixth in the U15s Boys vault, clearing 2.00 metres for a 20-centimetre improvement. 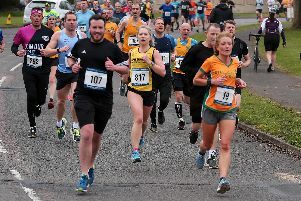 Whereas neighbours Matlock Athletics Club took part in the sixth Derby Midweek Race in eight events at Alvaston & Boulton Cricket Clubhouse, Raynesway, Derby on Wednesday, February 11. There was a one-mile race at 7pm followed by a 5k race at 7.20pm. The course had produced some very fast times in the last five years and many personal bests. U16s Joe Hallas completed the one-mile race in five minutes seven seconds, gaining him fifth place in a field of 43. He finished tenth from a field of 68 in the 5k in 17 minutes one second. He is also scheduled to take part in the English Schools Cross Country this week (W/C February 16).